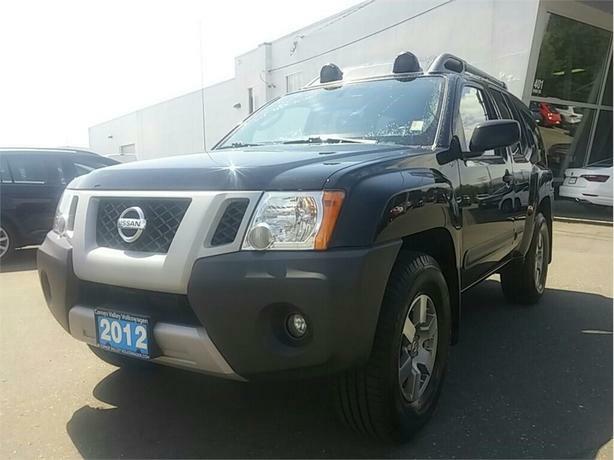  Log In needed $19,995 · 2012 Nissan Xterra Pro-4X Automatic - New Tires! Scores 20 Highway MPG and 15 City MPG! This Nissan Xterra boasts a Gas V6 4.0L/241 engine powering this Automatic transmission. Vehicle dynamic control system (VDC) -inc: 4-wheel brake limited slip (ABLS), Variable intermittent windshield wipers w/washer, Storage compartment under cargo area. This Nissan Xterra Features the Following Options Steering wheel cruise controls, Stainless steel exhaust system, Splash guards, Side door guard beams, Security alarm system, Roof-mounted side-impact curtain airbags for all rows w/rollover sensor, Rigid leaf rear suspension w/solid axle, Remote keyless entry system, Rear window defroster, Rear outboard 3-point seat belts. Stop By Today Live a little- stop by Comox Valley Volkswagen located at 401 RYAN RD, COURTENAY, BC V9N 3R5 to make this car yours today!